A woman loves all her trinkets and baubles. It really represents who she is, and each piece truly tells a story. So when the original bohemian trend of stacking up jewelry makes a come – back in modern times; it is exciting and happy news. First it was the bangles, bracelets and watches all worn together; now it’s time to dress up your fingers with a lot of rings. This jewelry layering lends an extravagance to your personality. And seeing the size and boldness of rings only increase in the last few seasons (the knuckle duster rings are one example), this trend is the next step. And with International celebrities like Rihanna, Jennifer Lopez and Sonam Kapoor, Deepika Padukone of Indian origin donning and favoring this trend alike, it is the right time for you to sport it too. Bold cocktail rings with colored stones set in and funky animal shapes look gorgeous together. Metal rings, inexpensive but with a personality are perfect for this look. If over the top is not your style, this trend can be materialized by using thin and sleek wire ring in gold, silver or rose-gold colors too. Thin band like rings would be minimal and yet the layering will show with multiple pieces. 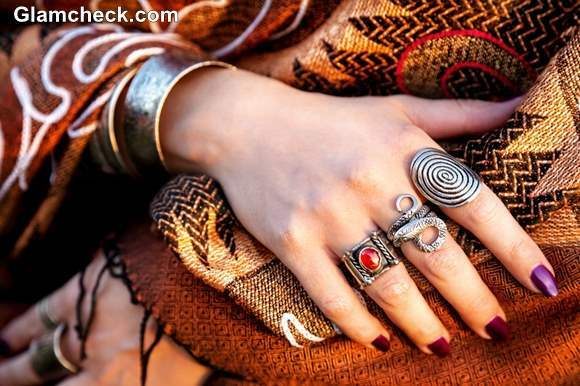 You could also wear top finger rings which allow the wearer to sport two rings in one finger as these do not slip all the way till the end of your finger. For this trend your fingers and hands are your canvas and their cleanliness can make or break this trend. Make sure you put your best hands forward, which are manicured well. Longer the nails, and deeper the nail color chosen higher the drama. Jewel tone nail paints matching the stone in your biggest ring or contrasting it completely can do the trick. You can to choose to French manicure them too for a classic twist. Extremely short nails too look sharp with a lot of rings. Either apply a clear varnish for a natural look and maximum attention to the rings only or paint them dark. When sporting an eccentric trend, remember to keep the outfit minimal. A white shirt teamed up with a maxi skirt and multiple rings in your fingers is a great combination. Choose the mood of the rings according to your outfit, for example torn denims and rebellious clothing will look better with skull rings and those with crosses. 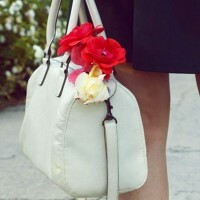 If you do not work in fashion, it is little surprise that this trend will not work for a conservative work environment. During the day, wear it while meeting friends or on a lunch date. When all dressed up for a cocktail party or a night of clubbing, jewelry stacking is your go-to trend. So go ahead wear your attitude with these rings, after all life is too short to blend in right!